However – like a lot of good things – summer inevitably comes to an end, and despite this recent bout of freakishly warm weather (please let it last! ), it feels about time to welcome in the autumn. And what better way to celebrate the start of a new season than through food? While the colder weather and lack of sunshine might make me grumble, there’s no denying certain foodie pleasures that arrive with the onset of autumn; chestnuts and pumpkin, incredible English apples, fresh crab, local game and beautifully ripe figs. This is the theme of the September – and my first ever – Mac Attack challenge; macarons of the season. Invented as a virtual kitchen by two (very talented) macaron-loving bloggers, Mac Tweets is a monthly challenge inviting participants from across the blogosphere to submit their recipes around a certain theme. The entries are seriously impressive – think miniature macaron burger buns, cocktails, ice cream sandwiches and every flavour under the sun – but inspiring rather than daunting; this is a place to share advice, learn new techniques, bounce around ideas or simply marvel at others’ creations. When choosing flavours for my first ever Mac Attack, fig felt like a bit of a no-brainer. These lusciously plump fruit are in season for such a short time, and so transitory a pleasure, that they seem to perfectly represent the changing of the seasons and the arrival of autumn. Being my first ever challenge, I didn’t want to play around with the consistency of the shell too much by introducing large amounts of liquid or flavouring, so I stuck with my basic tried and tested recipe, adding just a teaspoon of cinnamon for an autumnal tone. Figs have a naturally high sugar content so work wonderfully when reduced down – perfect for fig jam or (Carniverous Boyfriend’s favourite) fig rolls. Rather than using them fresh which I feared might make the macarons go soggy, I heated the chopped figgy flesh with water and a little brown sugar, bringing everything together in an intense sticky syrup. Finding it hard to make a sweet without including some form of chocolate, I then mixed together a dark chocolate ganache with a little cream and butter, adding just a touch more cinnamon to bring out the flavour in the shell. With a blob of gooey jam, a ring of creamy chocolate and the crispy crunch of the cinammon shell, my first ever Mac Tweet macarons were complete. Summer might be the season I love the most, but with treats like these to keep me going, autumn isn’t looking too bad either. What’s your favourite season? And what flavours would you like to try in your next batch of macarons? Preheat the oven to 170 degrees C/Gas Mark 3. Sift together the icing sugar, ground almonds and cinnamon in a large, dry bowl. Place the egg whites and caster sugar in a separate bowl and, using a hand-held whisk, whisk on full speed until a thick, aerated meringue forms. It should be firm, but not too dry. Take a third of the meringue and fold it into the almond and sugar mix. Once vaguely incorporated, pour the sugar/almond/egg mix into the remaining meringue and fold gently (this is important so you don’t knock all the air out) until fully incorporated. The resulting mixture should be smooth, thick and glossy. Take a sheet of baking parchment ans ‘glue’ it to your baking sheet using tiny dots of the macaron mixture. Fill a piping bag with the macaron mix and pipe tiny, shallow discs onto the sheet, slightly spaced apart. They should be approximately the size of a two pound coin. Tap the tray vigorously on a flat surface to help level out the mixture and leave for minimum 30 mins. This will help the macarons develop their trademark shell. To bake, pop the tray into the oven and leave for 10-12 mins. The macarons are cooked when you can lift them easily from the tray with a palette knife and the top is firm, but not coloured. Remove from the oven as soon as they reach this stage so they don’t overcook, and leave aside to cool completely. Put all the ingredients in a small saucepan and bring to the boil. Allow to bubble and reduce until you have a thick, sticky syrup with a texture like jam. To make the filling, melt the chocolate and butter in a heatproof bowl. Bring the cream to the boil in a small saucepan, then remove from the heat and pour over the chocolate and butter, stirring until melted. 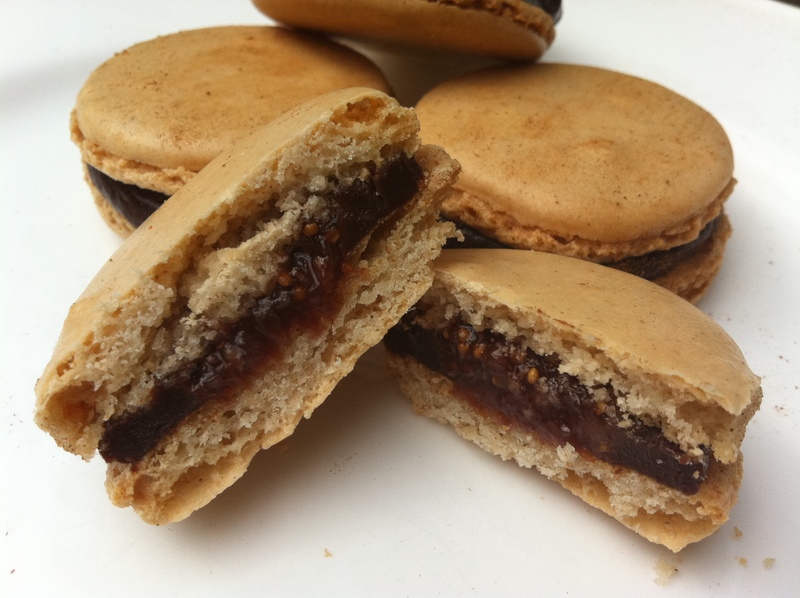 Drop half a teaspoon of fig jam into the centre of one macaron shell. 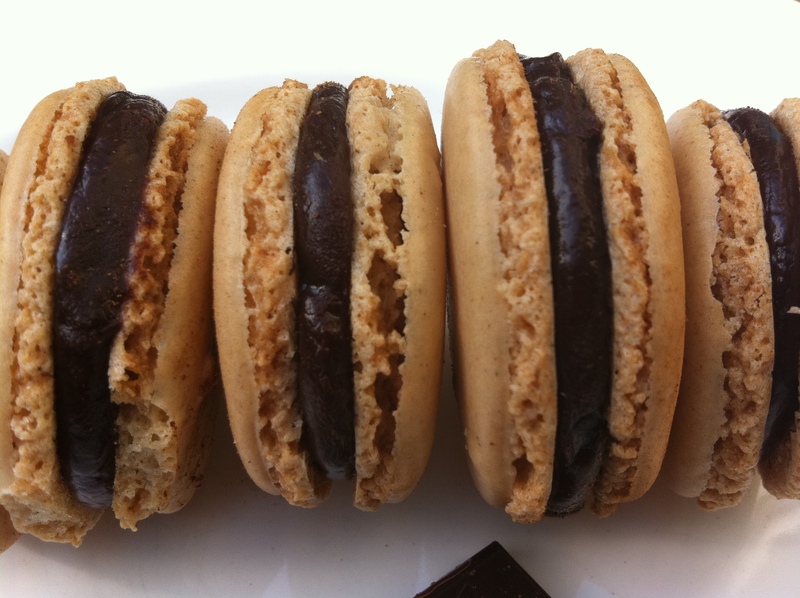 Pipe a ring of dark chocolate ganache around the fig jam, then top with another plain macaron shell. Pop in the fridge to firm up – these are best eaten at least 6 hours after making to allow the flavours to concentrate and the macaron to meld into a crispy, chewy treat. Ha this is the best combo and the first thing I thought of – cinnamon, chocolate and figs – when we picked this theme! So yay for you creating this perfect autumn mac! And what gorgeous macs! I am so happy you joined us at Mactweets and I hope you join us every month! Congrats, you did an amazing job! Oh my goodness, these look so beautiful! And just a stunning combination of flavours too. Love them! These look amazing and as a lover of fig rolls too (and chocolate of course) these sound right up my street. Macarons scare the hell out of me, but I’m happy to admire you experts from afar. I too was born in July, but I’ve never been a sun worshiper so although I like the long days, spring and then autumn are my favourites. Nuts About Food – aw, thank you – they were so much fun to make. London Bakes – thank you. It’s not a flavour combination I’d have thought up without the challenge, but really glad I did! Chocolate and figs – what a delicious flavour combination. Your macarons look gorgeous! Congratulation on a terrific first entry! Beautiful fall inspired macarons. I love the fig and chocolate combo and the cinnamon addition is just perfect! 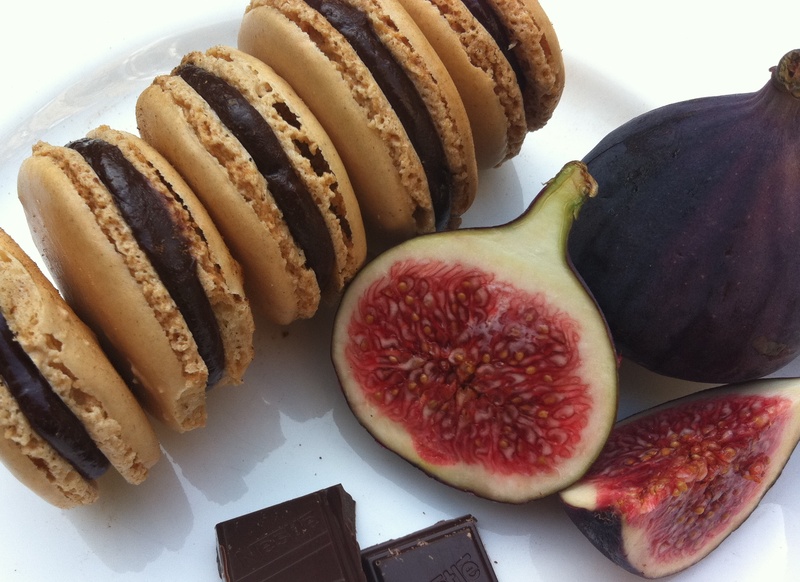 I love figs so so much and your macarons are simply gorgeous! I have only tried to make them once and they failed 🙁 Will have to try again! Welcome to the MacTweets family! What a pretty first post for fall macarons. I love the sliced mac photo and how the chocolate filling oozes out so generously! Looking forward to seeing more of your mac creations in the future! Choco Paris – thank you. Looking forward to many more challenges! Diary of a Mad Haus Frau – the cinnamon makes them taste really autumnal and brings the flavours together, definitely recommend. Hi Cookery – thanks for the welcome! They were really chewy and gooey inside with the fig jam…think I might have overbaked them ever so slightly, but practise makes perfect! Not Quite Nigella – lots more fabulous food to look forward to over the next few months. Is it bad I’m starting to think about Christmas?! Can I put money on you to win the Great British Bake Off next year please? I barely need any of my baking books now I have your blog! I love autumn and can’t wait for the trees to explode in their fiery shades of red and orange. 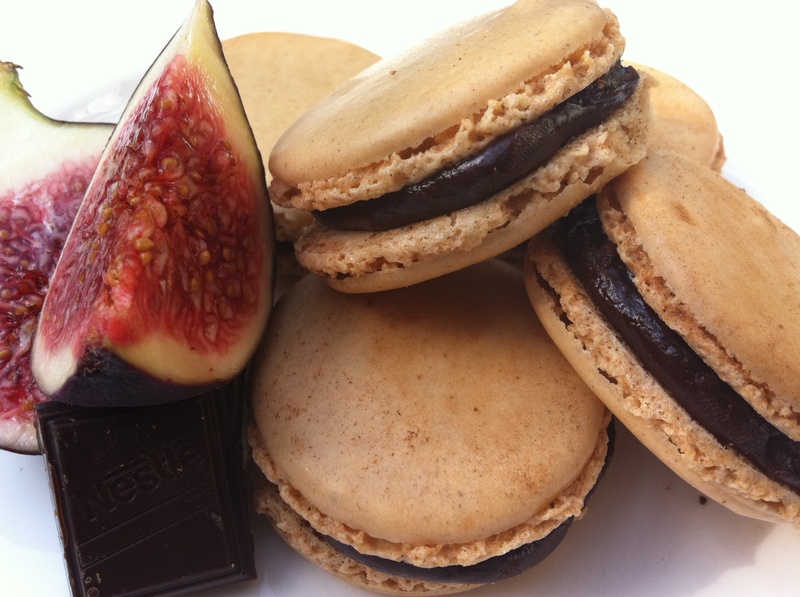 Your macarons look great – I’ve never had fig with chocolate and really like the sound of it. Oh my god these are lovely! I am so jealous of your macaron making skills. 🙂 And the flavor combination sounds really intriguing. Definitely a “macaron of the season.” Beautiful! Having recently bought some new piping nozzles, I have been looking forward to making some macarons. I’m not sure if my attempts will turn out as beautifully as yours, but fingers crossed! These look incredible and I will definitely try this combination of fig, chocolate and cinnamon, it sounds amazing. The Caked Crusader – fig and chocolate is fab. Try dried ones coated in dark chocolate too…yum! Working London Mummy – thank you, do let me know how you get on if you make them. The Moveable Feasts – it’s a really interesting flavour combo…well worth trying! With Milk & Flour – having a good set of piping nozzles is so much fun…suddenly you realise how people make their desserts look so beautiful! Beautiful macarons. The fig jam surrounded by a ring of chocolate ganache sounds delicious. Very creative and lovely! Love how beautifully you jumped to the challenge. Wonderful first entry to MacTweets, and hopefully there will be many more such inspired ones! Love the flavour combination … warm, comforting and PRETTY! Thank you for joining us! Yummm! I’ve never made macarons (and probably never will!) but I LOVE the idea of the figgy goodness in the middle. I’ve never really had figs with chocolate but it’s a combination I’d like to try sometime. I am totally with you and also prefer summer. Not that I born in July like you, but as a Scot used to colder climes I MUCH prefer the heat! And talking of heat, that warm cinnamon spice in your gorgeous macarons is a wonderful idea, paired with the chocolate but the clever addition of autumnal figs in there just takes them to another scumptious level. What beauties! Deeba – can’t wait for the next challenge, I had SO much fun doing this one. And the other recipes in the round up are so inspiring and beautiful. Such a great idea. Nutmegs Seven – you should give them a go, they’re delicious and such a nice thing to give as a gift. Plus they’re gluten free so suitable for pretty much everyone! 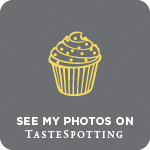 Faerietale Foodie – let me know how you get on if you do! Eat Tori – pina colada macaron sounds seriously good. I’m sure someone on the Great British Bake Off made them…might be a recipe on the BBC site. You do make the most incredibly beautiful things. littleloaf, your macarons look great! and i bet the fig filling is perfect, pure fall fruits at it’s best. by the way, spring and fall are my favorite seasons and i’m a sucker for salted caramel macarons! I love macarons of all sorts. Combining cinnamon, chocolate and figs just sounds gorgeous, especially as I am a big fan of figs. Fleur du Poirier – thank you! I’m a sucker for anything with salted caramel…I posted some chocolate ‘Snickers’ macarons with salty caramel a little while back…they were so delicious! Lemon – I’ve yet to try a macaron I didn’t like, although David Lebovitz has a recipe on his blog for ketchup macarons with a gherkin filling…not sure about that one! Izzy – aw thank you 🙂 Do let me know how you get on if you try any of the recipes…I did post one a while back where I forgot to mention when to include the sugar. Luckily a friend spotted it…although only after making some slightly undersweetened cupcakes! Marla – enjoy the figs while they last!